One of the world’s oldest and most famous tennis tournaments,the Wimbledon Championship, finished on July 8 in London, United Kingdom. Roger Federer (of Switzerland) beat Andy Murray (of the United Kingdom) to win the men’s singles final. The win was Federer’s 7th Wimbledon win and 17th Grand Slam title. You get a Grand Slam title by winning any of the four Grand Slam tournaments – the Australian Open, US Open, French Open, or Wimbledon. Federer also reached the World’s Number 1 tennis player spot (by the Association of Tennis Professionals) on July 9. He bumped Novak Djokovic to the Number 2 spot. 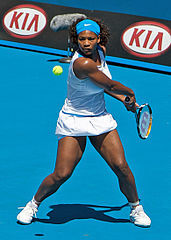 Serena Williams (from the USA) beat Agnieszka Radwanska (from Poland) to win the women’s singles final. Serena also won the women’s doubles final with her sister, Venus. Wimbledon is held every June/July. Some people bought tickets for over US$20,000 to watch the men’s singles final at Wimbledon. This year’s men’s singles final created excitement in the United Kingdom because the last time a person from the UK played at the final was 74 years ago. Image Credits: Sascha Wenninger for Serena’s image.